After much petitioning from neighborhood groups, the trailhead at the dead end of Beachwood Drive will be closed temporarily, according to the office of Councilman Tom LaBonge. And after. 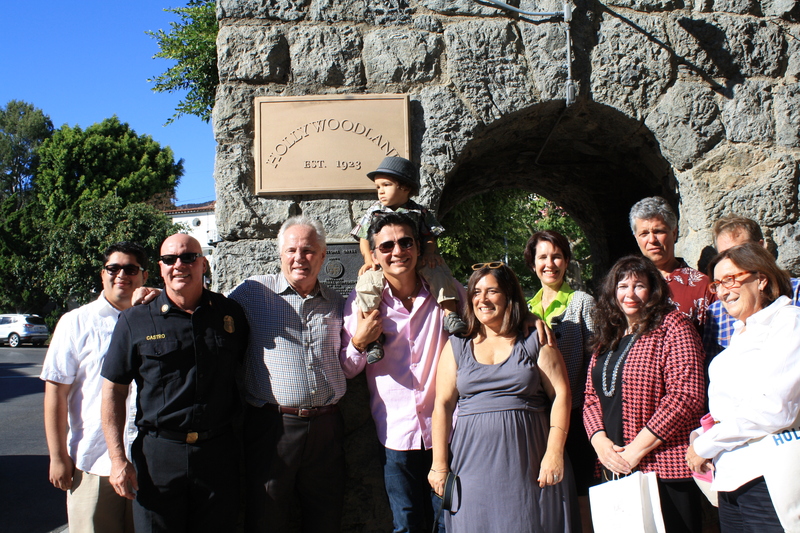 Among the attendees were (from left): State Assemblyman Mike Gatto, LAFD Battalion Chief Joe Castro, Councilman Tom LaBonge, HHA President Alex Chavez. As readers of this blog might remember, a couple of years ago vandals stole the pair of bronze plaques marking the Hollywoodland gates. Yesterday, their replacements–generously donated by Time Warner–were unveiled in a festive ceremony that brought together various officials and neighbors. Our ubiquitous City Councilman, Tom LaBonge, quipped, Hollywoodland is a special neighborhood–so special that you don’t even like your City Councilman. Titters ensued. Now, onward to our centennial! Motion (LaBonge – O’Farrell) instructing the LADOT to report relative to the feasibility of implementing a transportation pilot program that ferries tourists and hikers in a vehicle (no larger than a 10 passenger van) to the Hollyridge trailhead at the end of Beachwood Drive or the Hollywood Sign in a safe and organized manner. Oddly, LaBonge never mentioned this plan during the meeting, though surely it was on his mind. If implemented, Hollyridge Trail will not only remain open but receive even greater traffic than it does now. The vans are apparently slated to run every ten minutes, completing the transformation of Hollywoodland from a residential neighborhood to a tourist zone. For those who think it’s no big deal, the dead-end of Beachwood is a bottleneck with no place to turn around. Those who live there report constant problems from a steady stream of visitors, who vandalize property and smoke in a fire-prone area. A recent medical emergency involving two hikers on the trail had a delayed response because emergency vehicles couldn’t get through the crowds. Last night’s public meeting on Beachwood Canyon’s tourism crisis was notable in many ways. It was packed–so much so that I couldn’t find parking anywhere in the vicinity of Fountain Avenue and arrived too late to be put on the speakers’ roster. 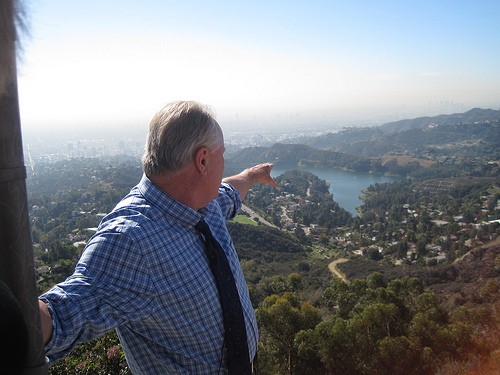 It was contentious, not only between the citizenry and Councilman LaBonge, but among various neighborhood groups with divergent interests–i.e., Friends of Griffith Park, which doesn’t want the closure of certain Park roads, versus the Hollywoodland Homeowners’ Association, which does. And it was horrifying, because it made clear that it’s only a matter of time before the unchecked flow of tourist traffic into Beachwood Canyon will have deadly consequences. Residents who spoke recounted the ways in which life in Beachwood Canyon has gotten more difficult and dangerous since the ubiquity of GPS. 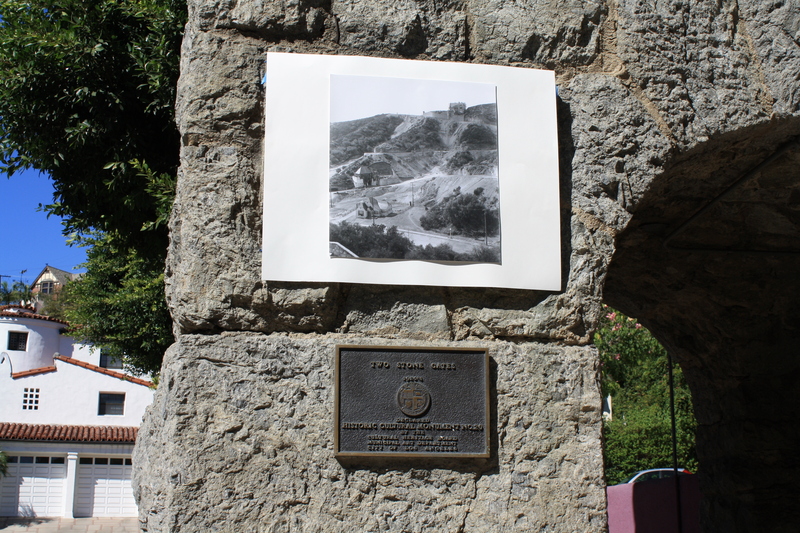 With 1,000 cars per day ascending the narrow streets around the Hollywood Sign, there have been auto accidents, threats against residents by tourists and tour bus drivers, emergency services delayed because of traffic jams, and round-the-clock intoxication, lewd behavior and vandalism throughout the Canyon. 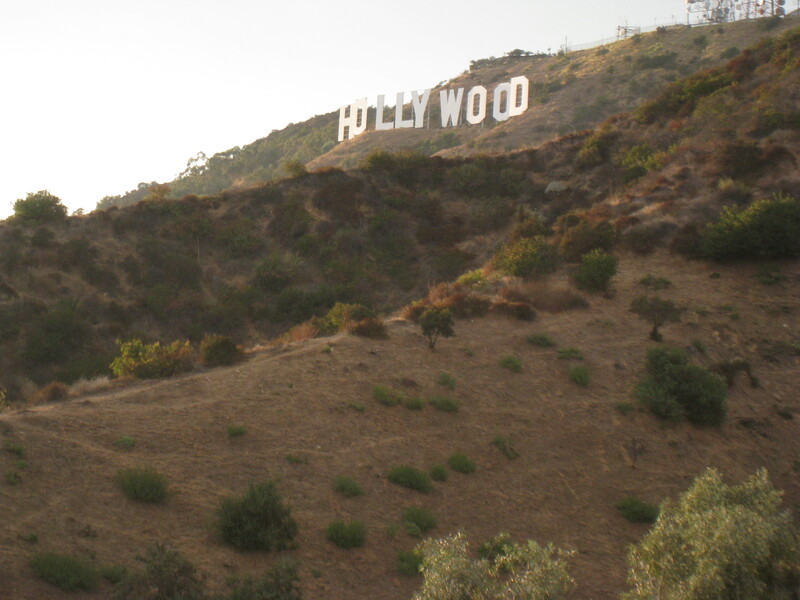 When I moved to Hollywoodland in 2005, I went to Lake Hollywood Park with my dog almost daily; we also hiked the trails once or twice a week. As time passed, our daily drive up to the Park became increasingly terrifying, as tourists refused to give right-of-way while driving downhill on Ledgewood, a street of blind curves. It’s unusual to have to slam on the brakes while ascending a steep hill to avoid being hit head-on, but that’s what I had to do countless times. My dog–a 95-pounder–was flung from the backseat onto the floor more times than I care to remember. Tourists cursed me when I told them, “Up has the right of way,” and refused to back up as required by law. I’ve stopped foreign tourists–from India and Brazil–after seeing them running every stop sign on Beachwood Drive–apparently knowledge of the word stop isn’t required to rent a car. Tourists smoke with impunity in a dry, fire-prone habitat, often within feet of the Smokey the Bear signs that Councilman LaBonge so proudly installed last year. I no longer go to Lake Hollywood Park or the trails: since my dog died last year, the danger of getting up there–either by car or on foot–has outweighed the pleasures of those destinations. It’s a shame, because the Park and trails were major reasons for my moving here in the first place. But times have changed: like many Beachwooders, I feel the neighborhood has been given over to tourists, and that we residents no longer matter. Councilman Labonge said as much last night. In response to a neighbor of mine who said, “The word on the street is that you care more about the tourists than the residents,” he angrily responded, “Not true. Not true–I care about everyone.” Any other politician would have said, “I care deeply about my constituents,” but not him. Still, I give Tom LaBonge credit for speaking the truth: when he says he cares about everyone, he means everyone in the world. Except of course those of us who live here, and whose taxes pay his salary. The councilman has tried to help us by funding weekend traffic checkpoints and installing Smokey the Bear signs. Now he proposes, among other things, a dash [sic] bus that would take hikers from the village all the way to the top of Beachwood. He also proposes painting the curb on one side of Beachwood (above Ledgewood) red to alleviate traffic congestion. Why do hikers need to be transported to the top of Beachwood? Because some residents object to large groups of young people (generally European or Asian, I’ve noticed–Americans are more likely to drive) traipsing up the narrow part of Beachwood Drive, where sidewalks are intermittent. Presumably these hikers will arrive in Beachwood Village by bus; otherwise, where would they leave their cars? As for the No Parking zone, it apparently is to begin north of Ledgewood instead of at the Village, two blocks south. Presumably all those people who park their cars on Beachwood north of Ledgewood will have to park further south, despite the fact that there aren’t enough spaces to accommodate them. Meanwhile, I RSVP’d for the meeting and asked to speak. According to Daniel Halden of Tom LaBonge’s office, the agenda hasn’t been set. But they know I’m coming. Beachwood Canyon falls within Los Angeles’s Fourth Council District, which since 2001 has been represented by Tom LaBonge. [Disclosure: I interviewed Councilman LaBonge for my documentary, “Under the Hollywood Sign,” in 2006, and have met him several times since.] For those of us who live here, particularly in Hollywoodland, his tenure has been an infuriating series of battles, as LaBonge long ago decided his true constituency is not us but every tourist who thinks Hey, let’s drive up to the Hollywood Sign and take pictures! Never mind that the Canyon’s streets are narrow, winding and residential: Tom LaBonge wants everyone in the world to come up here, even to the point of directing them personally. His latest idea for Hollywoodland is jaw-dropping, even by past standards. LaBonge has proposed an immediate elimination of 50% of the parking on Beachwood Drive north of Beachwood Village, meaning that one side of the Canyon’s only thoroughfare would be permanently off-limits to parked cars. The reason for this is obvious: LaBonge, a lame duck, wants cement his tourism-centric legacy by granting even greater access to sightseeing buses and vans (all of which exceed weight limits, not that this is ever enforced). The implications of this plan are devastating, not only to those residents who have nowhere else to park but to those of us who have garages. Apparently LaBonge thinks no one will ever need parking spaces for visiting friends, family or workmen, and that upper Beachwood Drive is his for the taking. There’s a hearing about the proposal scheduled for Wednesday, August 14th at 7pm at 6501 Fountain Avenue. I’ll be there, and I hope other Beachwooders–particularly those who live on Beachwood Drive–will attend as well. 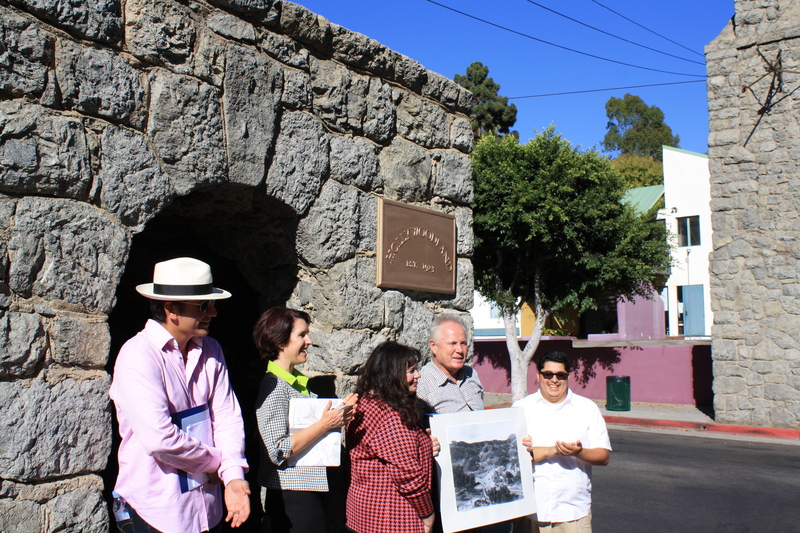 You are currently browsing entries tagged with Councilman Tom LaBonge at Under the Hollywood Sign.